I've been sitting a lot on Youtube. There you have it. I'm letting you in on my dirty little secret that's not something anyone seems to be ashamed of at all anymore. Every week I'm sent at least a dozen videos from friends with subjects reading: "you have to watch this" or "this is a game changer." So, I thought, instead of sitting on those videos and keeping the laughs, the tears, the inspirational moments and so on to myself, I'd share them in a weekly roundup of sorts. 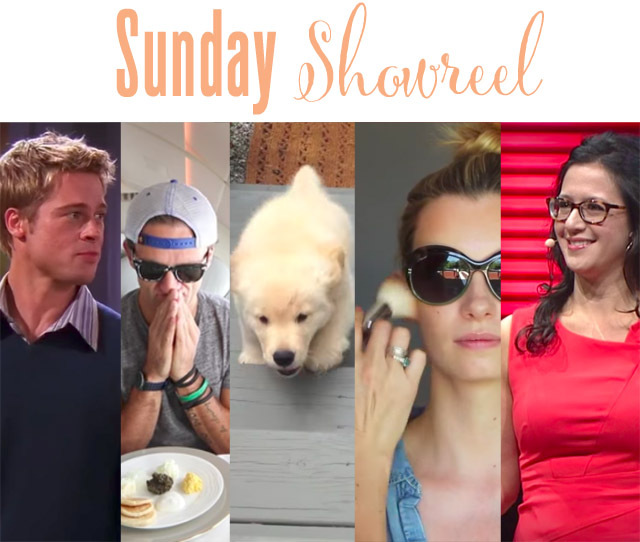 Introducing a new weekly segment called the Sunday Showreel. We will see how long I can keep this going. For now, however, I have five videos I've watched this week. Some I've watched several times before this week and others are entirely new to my Youtube favourites. Brew a cup of tea, put your feet up and enjoy. Ladies and gents, let this inspire you if you are in a slump and trying to figure out what your passion in life is and how that translates into a job. This will change everything you think about that way in which we are programmed to live our lives. Prepare yourself for a mind blowing TED talk. Alright, I feel like we need to go from dramatic to comedic for a moment and what better way to do that than with the famous Brad Pitt appearance on Friends. These were the glory days, back with the two lovebirds were still together. Oh how I miss the Jen & Brad days. Make sure you watch this in a place where you feel comfortable laughing out loud! Yes, we're taking another break from the serious action here and we're doing it with a video that's one of my most popular with almost 2.5 million views! This is an oldie but a goodie with Casey Neistat taking a first class trip from Dubai to New York with an unexpected upgrade. He documented the whole thing and it's just generally pretty insane.